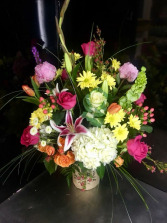 This modern design is fragrant and has all the right flowers to make her day. 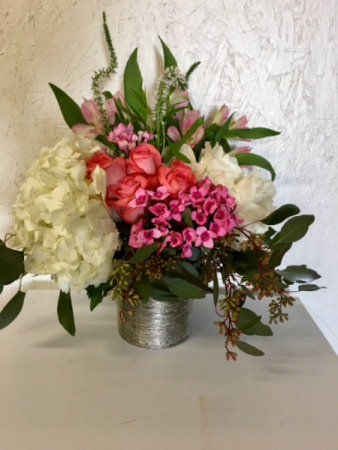 Hydrangeas, Veronica, roses, alstroemerias, eucalyptus and more designed in a beautiful handcut gold/silver vase she will display long after the flowers are gone. This stunning design is one of our most popular. 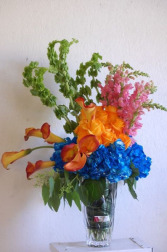 It’s beautiful, fragrant and colorful. It’s a statement that leaves a memory long after the special occasion. 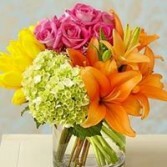 A clear vase full of the season's brightest flowers, elegantly designed makes a beautiful presentation. It's sure to make her day a memorable one.